Well, so much for regular posts … but I do have a new computer and managed to fix the scanner! 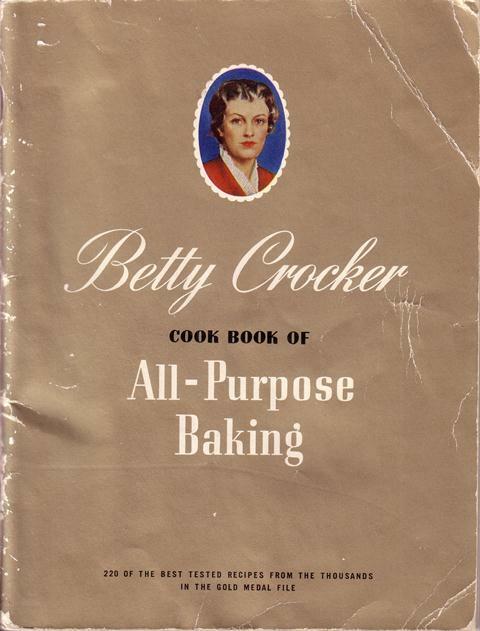 Betty Crocker Cook Book of All-Purpose Baking (1942) was a purchase from the Forgotten Bookmarks guy’s “Book Per Diem” site. It originally cost 25 cents and it’s lovely, with that gold-toned cover, color and black-and-white illustrations, ooh, and a test kitchen picture! I love those. 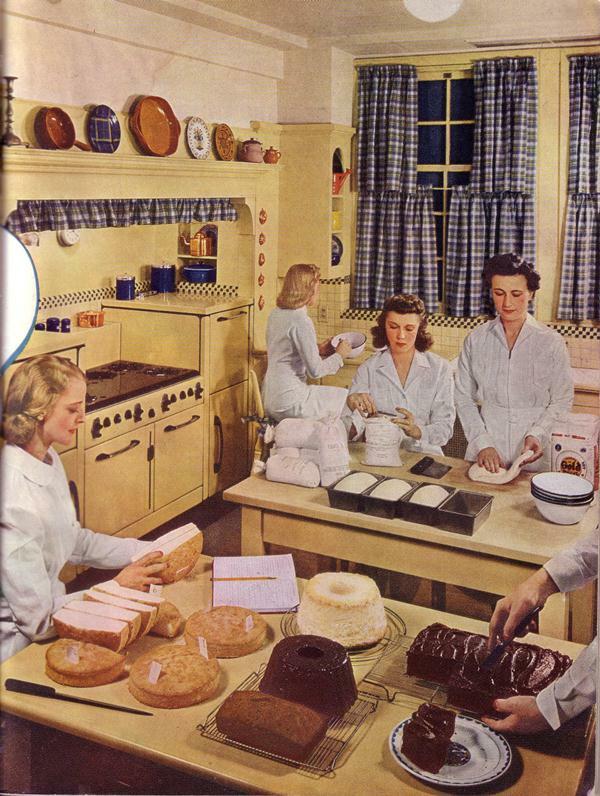 Top-of-the-line kitchen in 1942! Plaid curtains! I love the way the oven/stove alcove has a mantelpiece. Anyway, it’s an excellent basic cook book. It even repeats the bread-shaping instructions that work so well. But I needed a frosting for a cake I made, so I tried one of its recipes. While syrup is cooking, beat egg whites until stiff enough to hold a point when beater is pulled out of them. Pour hot syrup very slowly in a thin stream into stiffly beaten egg whites … beating constantly with rotary beater [or, y’know, a stand mixer!] until mixture is too stiff to manage with beater. If working alone, pour only a bit of syrup, then beat vigorously – and continue thus. So, this went pretty well except I should’ve used a smaller saucepan – it was really hard to get a good reading when the pan contents were so thin, and I think I overcooked it a bit. I wound up with a thin thread of sticky hard candy on my mixer’s beater! But the rest of the mixture went in okay, and for a few minutes I actually had really good frosting. Then it cooled a bit too much or something, and didn’t go on the cake quite as smoothly. However, it came out exactly like store-bought cake frosting! Which is not so good, actually, since that means it was frothy but not all that sweet or flavorful. Still, it represents progress in my frosting-making efforts. I wish I knew where this church is – I’m almost certain that I’ve seen that building in person in Connecticut somewhere, but Catholic Churches aren’t really my thing as a rule. I paid a dollar for it (and was amused by the vendor’s spiel about how generous he was being to accept my offer) and was actually going to donate it since 1962 is past my usual collection date, but I’ve read through most of it and I can’t let it go. It’s not pretty to look at (consider the hand-drawn cover! ), but it’s full of weird and interesting recipes. 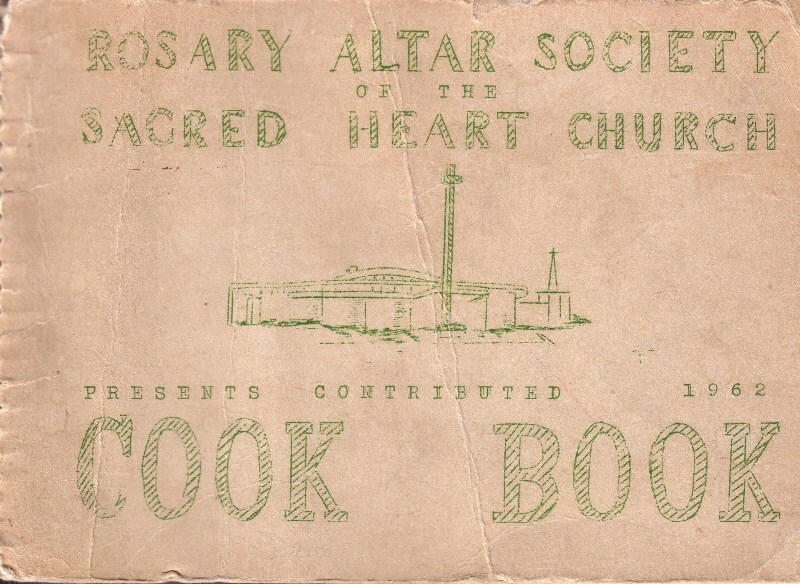 Mostly baked goods, actually, with a small section of “Main Meals” and another of “Lenten Meals” (the rest being breads, cakes, pies, cookies, and miscellaneous). Hand-typed on an actual typewriter, and then probably turned over to a local printer to be copied (mimeographed?) and bound. 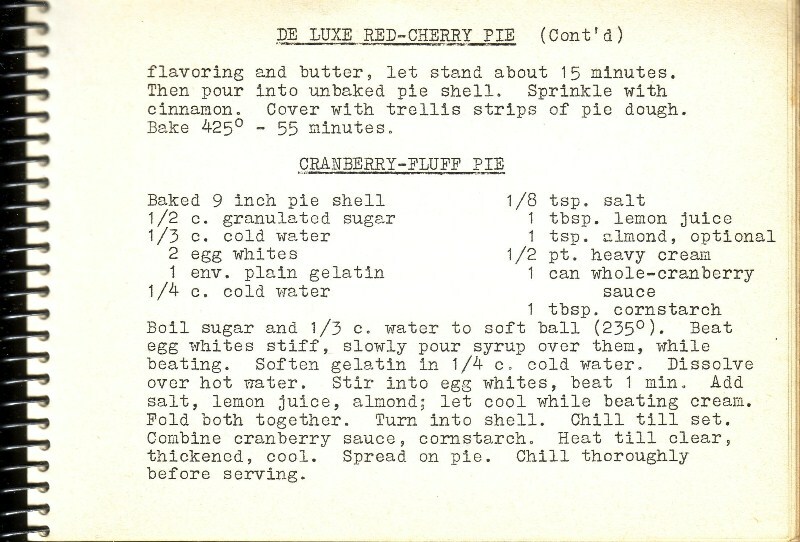 I haven’t tried any of the recipes yet, but that “Cranberry-Fluff Pie” holds me fascinated. Could it possibly taste good, or at least be worth all the trouble of making it? And who would come up with such a thing in the first place? There’s a Sacred Heart in Berlin CT, where I grew up, but I can’t swear to its being the only one. Yes, there’s quite a few Sacred Hearts! That’s part of the problem. But there can’t be many that look like the one on the cover of this book – yet what I suspect, since I haven’t been able to find it online, is that it’s maybe not a Catholic church anymore.